On account of the waiting period (between 1 and 5 months) involved in meeting the entry requirements to Canada and Quebec, we strongly encourage international applicants to apply for the fall term only. You must hold a Bachelor of Business Administration (BBA), an undergraduate degree in a related field or a degree deemed equivalent by the program administration, with a GPA of at least 3.0 out of 4.3, or the GPA required by the original university for admission to a graduate program, if the latter is higher. You must have earned as a minimum a general license diploma after 3 years of university studies (180 ECTS) following a secondary school baccalauréat (BAC+3), with an average of at least 12 out of 20 for all years of university. Admitted students holding less than a BAC+4 must complete a short MSc preparation program. You must hold a university degree giving access to a master’s program at your original university, with an average of at least 12 out of 20 for all years of university. Successfully pass one of the following tests before the application deadline for the program. Candidates who have completed at least 45 undergraduate credits in Canada or at least 30 graduate credits in Canada when submitting their application are not required to take these tests. Have successfully completed 9 credits in the short graduate program with a GPA average of at least 3.0. In this case, you must submit the Short Administrative Request form. Have advanced proficiency in English when applying. If you have an intermediate-advanced level proficiency, you will have to take the course 36-105-99A - Business Communications – Advanced from your first year of studies. Note that the labour market in Quebec, and particularly in Montreal, generally requires a good knowledge of French. 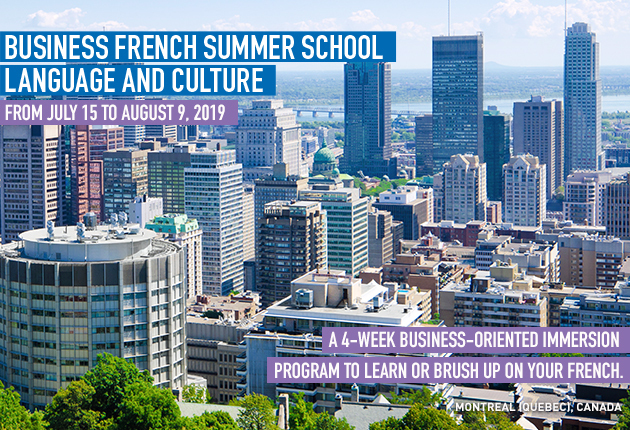 Students who do not have the requisite level of proficiency in that language are strongly encouraged to take qualifying courses in business French.